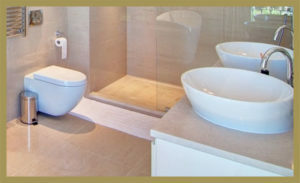 Whether you require a brand new luxury bathroom, a wet room, or just some general repairs or replacements, we bring over twenty years of experience to every bathroom fitting we complete. We cover the areas of Blackpool and Lancashire area, including Bispham, Cleveleys, Fleetwood, Lytham and St Annes. We also work with private landlords and small commercial property owners wanting an affordable bathroom fitting service. If you need help with having a bathroom fitted, just contact us on 01253 625 015 for a quote. Why Use TM Maintenance’s Bathroom Fitting Service? We are happy to advise on the best use of space for your bathroom, and together we can work out a plan to create a relaxing and luxurious room for you and your family to enjoy. We bring all our own tools with us to every job and we are upfront about our prices. We will always give you an accurate quote before we start any work. We can also tile or paint and decorate your room once it’s finished, giving you a complete service so you can enjoy the bathroom of your dreams. We have over twenty years experience of plastering, painting and decorating, tilling and kitchen and bathroom fitting. We always like to discuss projects with our clients in detail, ensuring we give you the best possible service. If you’re interested in having your bathroom fitted or in any of the other services we offer, just fill in the contact form on our contact page here.